I can’t tell you how many times a student has confidently told me that he or she does NOT like what I’m about to serve. I remind them of the “no thank you bite” rule, they try it, and then they ask for seconds. In my classes with K-2 students, we are focusing on the six edible parts of the plant. Last week we were on “flowers” so we sang the Banana Slug String Band song, did stretching exercises to review the six parts, talked about cauliflower farming and roasted cauliflower with olive oil and salt in the portable oven. Again, I made converts with this simple technique. Even better, I’ve had many parents tell me that their students have brought this idea home, insisting that siblings take their “no thank you bite” at the dinner table! *Thank you to Olivewood Gardens for this great tip! An effective phrase for teaching nutrition to children is “eat a rainbow!” The simple idea is that eating fruits and veggies of all different colors builds a healthy diet. We made this a theme on Food Day 2015, and I want to keep building upon it. Sage Garden has provided us with their notebook of recipes which includes a different color smoothie for each grade. I pulled all of the different colors and am doing “Drink a rainbow!” workshops for my after school students. I began by setting up the Sage Garden cooking cart with all of the equipment and ingredients laid out and the recipe written on the whiteboard. Then I gave each pair of students a stack of laminated fruit and vegetable cards produced by the California Department of Education. The students sorted the fruits and veggies into two piles: orange/yellow and other. We talked about all the orange and yellow examples we found. Students came up one by one for the various jobs: juicing the oranges, peeling the bananas, pressing the limes, adding the strawberries, measuring out the yogurt. The next week we did purple smoothies, and this week we will blend up red ones. As you can imagine, it’s a very popular class! I know what you’re thinking…cool season vegetables and microscope work and educational outcomes are all very well and good, but what are garden educators wearing this season? This tee represents the genre of conference souvenir. 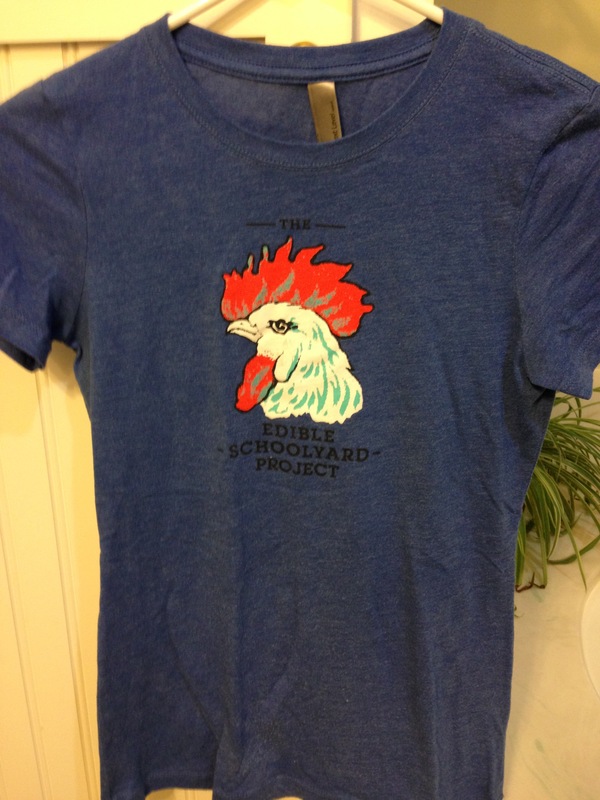 You’ll remember I loved my time at the Edible Schoolyard, so I love remembering it with this rooster. Related to the conference shirt is the “organizations I support” look. 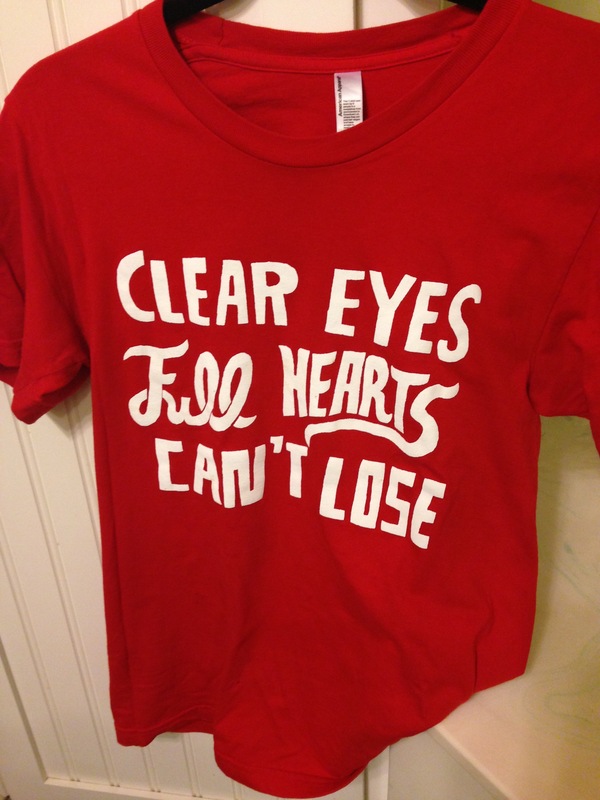 Ripped from Friday Night Lights, this tee makes people think I am a football fan. Which I am not. But I loved that show, and I love this sentiment. Found on an internet search for gardening shirts. I couldn’t resist adding one more take on the “keep calm” craze. Is there a day when we don’t need to remember this? A gift from a friend purchased at Sherry Horton’s gorgeous Julian shop, E. Barrett General Store. 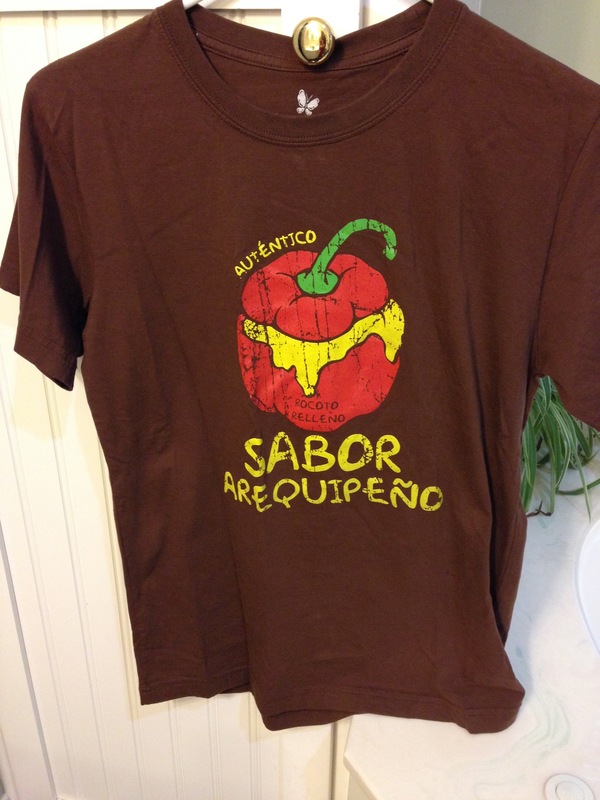 My husband went to Peru and brought back a t-shirt with a drawing of a stuffed pepper, a local delicacy apparently. True love. Purchased on the clearance table at the Monticello gift shop. I guess I’m one of the few that couldn’t resist a drawing of an eggplant— the most beautiful plant, according to Jefferson. Another trip tee—this one from the Washington Mall during cherry blossom season. Local food t-shirts work well in the garden. Let’s not forget the event t-shirt—my go-to baseball-style shirt for our annual Food Day celebrations. And I’ve saved my favorite for last: a Tracey Allen original. 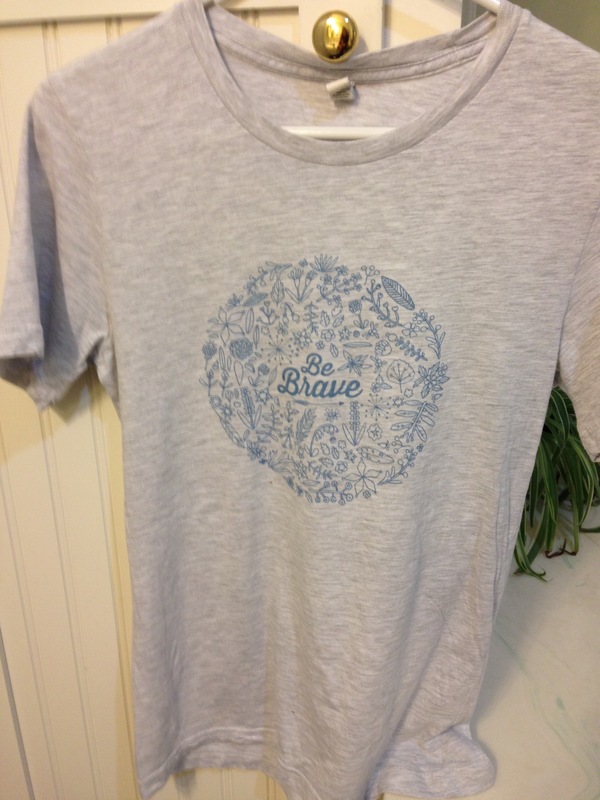 This is “Choose Kindness.” See her lovely designs here! In closing, I should mention that any of the above shirts can be paired with jeans and tennis shoes. Or a funky skirt and sandals. Hats optional, minimal accessories. 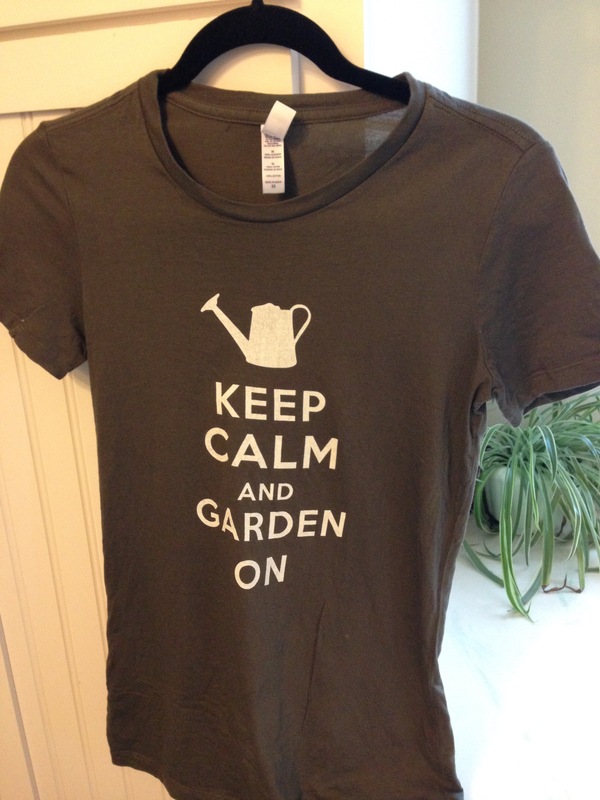 The options are endless in the world of garden fashion! It was a good morning in November when I answered the Pathways phone and an AmeriCorps team member was on the line, asking if we would like a group of volunteers for a day of service at school. On December 18th, we welcomed eight young people from all around the county on a 10-month term of community service across the western states. They had been in Julian for six weeks, staying at Camp Stevens and working on building and clearing trails, planting natives on Volcan and helping out around town, such as assisting locals in hanging all of the holiday decorations on our historic Main Street. On our day, they worked with Pathways, helping to wrap presents for our toy drive, moving a sandbox for the special ed. department, planting bulbs, painting our table, and installing a hoop system over our raised beds. I also asked them if they would be willing to do a 15-minute presentation to the 4th and 5th grade classes. They were happy to do this and visited each class to discuss the concept of AmeriCorps, what projects they had already contributed to, where they were headed next, and what they had learned about committing a year of their young lives to service in various communities. I also asked the team to share some of their reflections on living in Julian with our students, as it’s always great to get an outsider’s perspective on what is just “daily life” for you. They talked about the natural beauty of Julian, the close-knit community who had welcomed them wholeheartedly and of course, the apple pie. After taking a few last questions, I hustled them out the door so the students could get ready for lunch. As I did, some fifth graders followed us with pen and paper and started asking the AmeriCorps members to sign their names. Suddenly I realized the kids were asking for their autographs! The AmeriCorps members realized this too as they signed paper after paper, laughing that this was definitely a “first” for them. Oh to live in a world where the people who volunteer and serve in communities are the celebrities! And thank you to the amazing Mrs. McFedries who has taught her class to respect and be grateful for people who serve others. Bless you AmeriCorps team as you continue to make the world a better place! Leaf rubbings in garden class made sweet placemats for “Take your parent to lunch” in the garden. Following up on the “How is it grown?” video the students watched on Food Day, we made a simple cranberry relish with orange juice and local honey. While the cranberries cooked, we worked on updating our garden journals—-decorating the covers with images from garden catalogues and inserting recipes and other lesson materials from the last couple months. I took the portable speaker out to the garden to play Christmas music as students went wild decorating the garden. Where could they hang ornaments? Anywhere they could reach. For out last garden class in December, the younger grades made tangerine pomanders—a highly sensory, fine motor activity. Older students do an activity that is now a bit of tradition around the holidays: wreath making with freshly cut cedar and rosemary sprigs. Freezing weather sent us inside for a few garden classes. Here students measured out their own healthy trail mix and munched on it while we played garden bingo. Anticipating a lot of cold, wet weather to come, I am now thinking through new inside garden projects and activities for the rest of the winter. More to come in the new year: our visit from Americorps and garden fashion! Thanks for following along in 2015! And thanks for sharing my love and enthusiasm for “all the good things that happen in school gardens.” Happy New Year! As part of our Food Day program, Sun Dog Art Studios led an anti-soda art project at the junior high. Each student made a “monster” out of a soda can in thirty minutes using construction paper, puffy paint, scissors, straws and pipe cleaners. Teal and Tomy, the founders and art teachers of Sun Dog, were a delight to work with, and I highly recommend them to any school or organization in San Diego County. Sun Dog made these samples with information on soda consumption which they left with us to incorporate into our displays. Librarian Colleen allowed us to hang half of the collection behind the checkout counter at the Julian Library the next day. The collection will stay up through the end of November. I hung the other half at the Wolf Den, the junior high multipurpose room. Stay tuned for more wonderful reports from Food Day 2015…..
Today Julian Elementary and Junior High celebrated National Food Day with 15 workshops on nutrition, cooking, backyard gardening and agriculture. It was amazing—look for upcoming posts with photos and stories. For now, let me share a video with you. Every year people across the country celebrate good, fresh food with an Apple Crunch event. We did one this year, thanks to Ken and Linda Limon who visited a neighboring orchard whose owners allowed them to harvest for free, picked 400 apples, hand sorted them, packed them in flats of 50 and delivered them to cold storage in the school kitchen. We washed and bagged them by class size. Students wore their red No Excuses shirts to school, Garden Ambassadors held up big leaves, and our principal got on the roof to film the event. The weather was sketchy today but it held just long enough…..five minutes later, downpour! Simply amazing. Thank you Linda and Ken—you made this happen!